My loose plan was to write something light, bordering on witty or–more often my writerly bent, something laced with references to spiritual experiences, the nearness of God everywhere. About maximum appreciation of life, which tends to claim first priority. That was before I got the foot news. 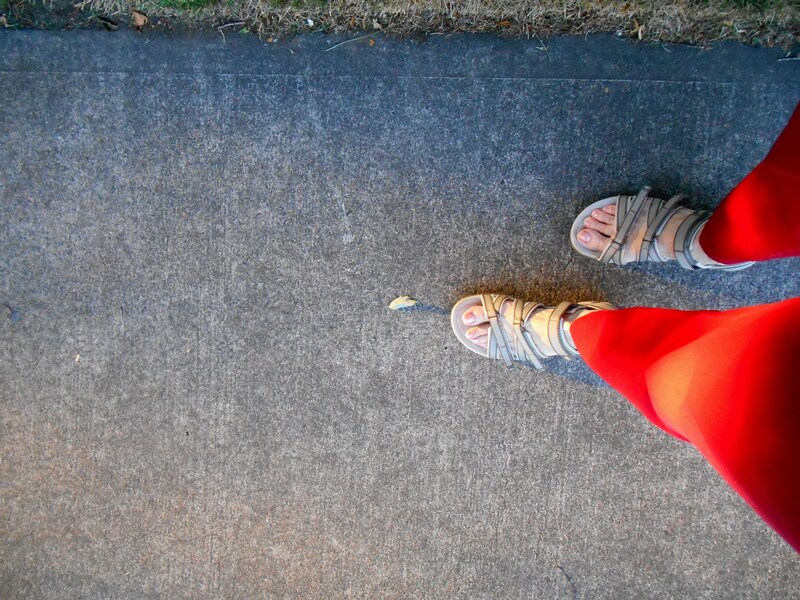 Alas, I am to wear it all the time I am walking in my home or at the grocery–anytime I put weight on my left foot. That means in bed and in the shower I can have a free, naked foot. Otherwise, this goes on for five weeks and then another x-ray and review. I am a barefoot person. My feet have never liked their toes and high arches, skinny heels and ankles swaddled or bound in leather much less fake leather or cloth. I don’t even like flip-flops. Nothing fits so well as your own skin. Though I do have quite a few shoes stored in the closet, I’ll admit, but they’re leftover from working days and do need to be passed on. And alright, I love my ankle- and knee-high boots. They fit very well and are useful since I have to wear something outdoors to shun the damp chilliness during wintry Oregon deluges. A good leather boot can come close to conforming to one’s lower extremities after a good break-in period. It has flexibility and strength, characteristics I admire. I hope to be wearing such a pair of boots well into my old age when I cannot tromp around barefoot. I want to be wearing them as autumn arrives–if I manage to enable excellent self-repair. Even socks in chilly weather tend to annoy me. They’re a barrier between skin and fascinating environments the foot examines and treads. Who came up with this accoutrement of footwear? Why don’t they fit snugly as fine gloves fit on hands and digits? Of course, I’m not so foolish as to ignore that protection is at times required in the natural and human made worlds. Especially in unpredictable city life. So I purchase those, too, after much inspection, finding the best cotton warmth, cushion and comfort for the least money, a challenge. Oh, did I forget to mention I broke some small bone beneath the ball joint of my left big toe? That’s what all my fuss is about. A slightly broken foot. It started about five or six weeks ago. I was vacuuming around my bed. The vacuum isn’t one of those light and easy machines and I am not a happy vacuumer but I swear I did nothing different that day as I maneuvered about. I did not jam my toe into furniture. I did not fall and nothing slipped onto the bare foot as I worked. I just felt a sharp pain under the big toe. I checked it out. I thought it might be a spider (bare skin and spiders…) as we have many of those lurking in our geography and bites are not so uncommon. It could have been an experience I infrequently have due to taking aspirin for coronary artery disease–tiny burst capillaries that hurt and bruise a couple of days. But I saw nothing. The next day, however, there was selling and pain, a small spot of bruising. I expected it to go away but it lingered. A trip to my primary care doc resulted in a diagnosis of tendonitis. In the toe area. How that occurred, she didn’t clarify. Apparently this can happen for any number of reasons to active people. What was not great to hear: stop my vigorous walks and no hiking for me for a few weeks. Doctor made a referral to a podiatrist, just in case. There was an X-ray for good measure. It came back negative per my email from the health care system. So I continued to live my busy life, iced twice daily, rested the offended foot a times and believed it got better. There continued to be some swelling and soreness so I tried to behave and not walk much the first 2-3 weeks. I walked a bit more the last couple of weeks, perhaps 20 minutes with slow strides every other day, rather than the 4-5 miles a day as I usually do. No hiking in the summery, fragrant forest. I felt proud of myself for mostly following directions and not whining about it. The podiatrist appointment wasn’t for another month. When the date rolled around, I nearly cancelled it as the hurt area looked and felt much better. I’d walked lightly (no power walks) recently without much of an after effect. I figured I would get a good bill of health and pay 60 dollars for the privilege of hearing it. Instead, she pulled up the X-ray after telling me she didn’t think it was tendonitis, at all. I didn’t hear the rest. I had stopped looking at the screen and that narrow, incredibly frail-looking skeleton of my left foot. That terrible line across a small bone under or within my toe–who knew there were so many? Really, vacuuming the carpet? There had to be a mistake. She kept talking and I tried to focus. I gazed at her face and saw her lips moving but all I could think about was that I would not be walking anywhere, anytime soon. I would not be taking off to enjoy arduous and meditative hikes in the Columbia Gorge or scouting out numerous trails around Oregon and Washington. I would not even be exploring our own semi-famous Forest Park flourishing right in the heart of Portland–all its hidden delights would be unexperienced for the rest of the summer… and maybe beyond? I would be sitting on my posterior for the rest of August and September doing…what? I am not a sitter nor a lolligagging type. I am, for good or ill, charged from the time I get up even if a cranky sleep has failed to be regenerative enough. My husband, more sedentary than I, urges me to stop: “Take a load off, sit down a few.” I try but tend to pop back up. Only when I write can I make myself sit for a long while without moving a great deal. I find myslef reading when standing, sometimes sitting, my concentration accompanied by twisting, stretching, getting up and down. By midnight I give it all up and hit the bed, finally tired. Then I read or write without much other motion as I drift off. It’s not that I’m hyper; I don’t feel nervous/anxious/unfocused. I simply love to be in motion. There are plenty of things to do, places to go. Even if it is from the dining room to a back bedroom to gather something. There is such a joy to it, the lifting of limbs, bending and reaching and turning in space. I spontaneously dance, walk for miles, jog a vlock or two, climb hills and embankments. Ice skate. Tai Chi or a bit of yoga. Flamenco classes. Gym machines and Zumba. I used to get a thrill from water skiing and swimming and look forward to swimming again at a new pool. Sailing was a treat. It’s about working up a small sweat, giving the muscles and all a chance to get up and go, shine some. The body loves to do. When we still lived in houses with big yards, I was the first to grab a rake or spade. I was fine shovelling snow. I tried skateboarding when my son was learning decades ago, then tried it once again not long ago (he has been a pro skater for 20 years). Not with astounding success but still, it was fun. And dirt biking? Let me hop on as I did in my twenties, please. Gosh, even sitting with pencil and watercolors and sketch pad gets various parts ready to move. What do we do that does not elicit some sort of motion, subtle or pronounced? Our bodies love us back when we give them free rein–or give them orders to do thus and so and it does it well and right. These beautifully designed vehicles to carry around soul and mind become more relaxed, strong and flexible with systems engaged, optimally humming along. We have what we need to thrive, most of us, and malfunctioning parts most often repair and adapt well. We can endure much before the body has the wisdom to quit. All this activity obviously requires–at least prefers–feet. How we rely upon these jointed, muscled, tendoned appendages every single day! So I left feeling a bit sad even though it could be much worse. I may have said a bad word and smacked the steering wheel before I revved up the engine and took off. 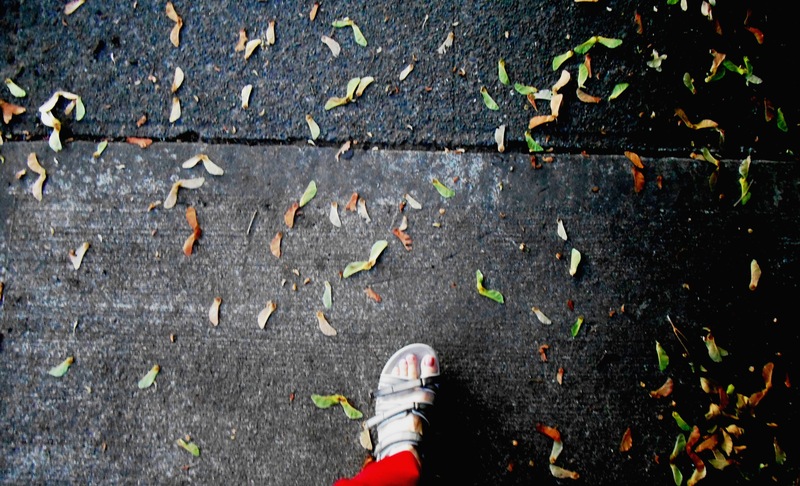 I can and will soon walk and hike in our temperate, rainy winter as always. That is three months away. I surely can do this and be gracious about it, yes? There are so many other things I might have to contend with. It is just another brief pause in life. The whole summer has been in an elaborate pause, to be honest. Except, my mind and emotions have been whirring away. We had a scare with a depressed family member that is resolving day by day. Prayers for courage and hope have paid off; prayers for her resilience have gathered steam. I have had the honor of being here daily as she has regained hold of her strengthening center. Then, of all things, I had a simple dental extraction that became a nightmare. After a month I am finally recovered from a dry socket and an infection that required antibiotics with the attendant negative reactions. I haven’t eaten much for a month–the yogurt and rice, applesauce and bananas are looking less wholesome and more repugnant. Still! I lived through brain-scrambling jaw and face pain and complications. I can manage to take care of a gimpy foot. And so it has been a time steeped in a haze of needs, some trials, my own self struggling a little. Oddly, I recall telling someone back in the spring that this summer I would need stamina for the coming months. Yes, and patience, more than I imagined. Yet it has been supplied like life-giving water from a well wide and deep. I have found it between times of tension and worry, within a grateful embrace of each day. And compassion for myself and others. Living within the moment, as they say, works wonders–we do not need to resurrect troubles of the past or try to forecast what is unknown. The one thing that never changes for me is my faith in God, the surety that we are not alone in the wilderness of life, that we are a part of Divine Love no matter what. We can be pushed and pulled, stretched to the limits. And we can manage so much more than we think possible. We just have to trust that we can, then step forward. Or in my case, sit back, take a deep breath and be still. Surrender. I have taken that hard, suffocating boot off as I’ve typed. 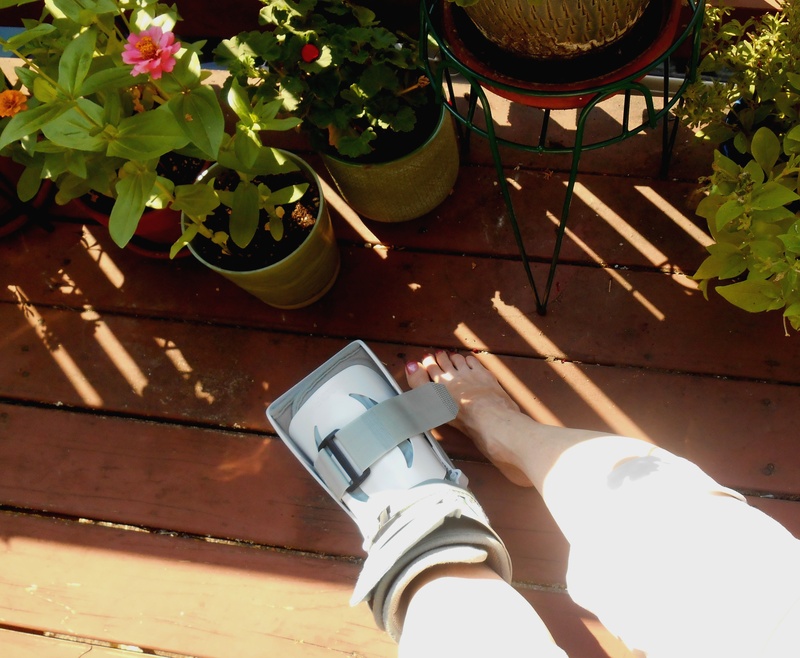 My foot needs fresh air and sunlight; it’s 85 degrees and blue skies! But I will put it back on when I walk. Yes, that is my best intention; God and my angels will help me along as ever. Once again both these feet will be sturdy and happy, may even fly in the right conditions. In the meantime, perhaps more contemplation is in order, and a bit of a gentle rest. Thanks for the well wishes. Yes, it IS getting to me and I have four more weeks, at least! This, too, shall pass, though–it could be worse…! Oh Girlfriend, allow me to cry with you! I know the pure joy of movement, the freedom and the great sense of well being that comes from being active. I’m going to suggest something: stretch bands! I have three different sizes. You can sit and use them to your hearts content. They will work your upper body as well as your core. Once you are back on your feet and ready to power walk and hike, you’ll be ready to go! I bought my bands back last year when I went thru three bouts of pneumonia and I was bedridden. They helped me keep my sanity! I purchased them at a discount store. You don’t need special instructions…just create movement and resistance. Thanks for that reminder–I already got and used them from sometime back when in physical therapy. Glad you survived all that tough pneumonia…egads. Thank ypu, as well, for the encouragement–cheers!